cast with a boldly modelled bixie on top of a solid block with slightly canted sides, the auspicious beast shown in a dynamic twisting pose with head held high and mouth open revealing fangs and teeth, a pair of ribbed horns curled back from the top of the head, tufts of fur at the cheeks and a long beard extending from the chin to the swelling chest, the shoulders with folded wings, the surface very well preserved, the flat base inscribed with four characters in fine-line seal script. 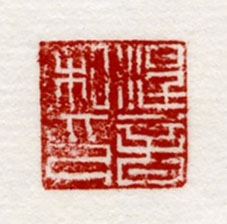 The seal may be read as Nie Yin si yin (涅音私印 private seal of Nie Yin). 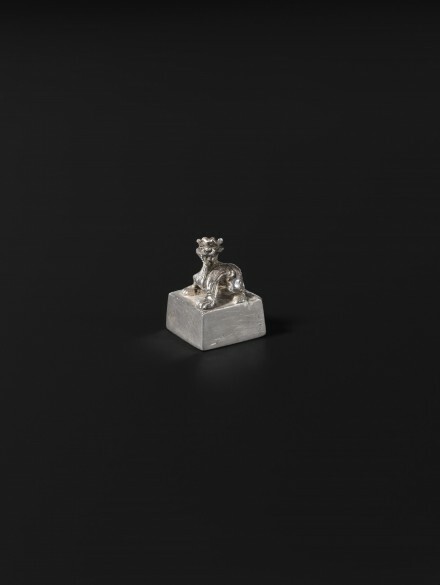 The bixie, an auspicious mythical beast said to have the power to ward off evil in Chinese mythology, was a popular subject in the Han dynasty and many Han seals with bixie knops are recorded, but cast silver seals surviving from the Han period are very rare. A similar gilt bronze seal cast with a bixie knop, in the National Palace Museum, Taipei, is illustrated on the cover of A Catalogue of the Special Exhibition of Bronze Seals Throughout the Dynasties in the National Palace Museum, Taipei, 1987, and also illustrated in several views inside the catalogue, pp. 241-242, no. 170, attributed to the Eastern Han dynasty.